The Thousand Teachings (Upadesasahasri) of Shankara is an exposition of the non-dual philosophy written by Shri Shankara, the great philosopher-sage who established the non-dual teachings as we know them. Most of Shankara’s writings are in the form of commentaries on other texts, such as the Upanishads, and deal with subjects mentioned in those texts, much of which is not central to the non-dual teachings. There are a number of other books on non-duality itself, which over the centuries have been attributed to Shankara, but which many scholars now believe were probably written by followers. 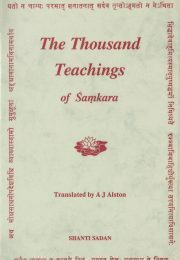 The only text that is not a commentary on something else, and which most authorities agree was definitely written by Shri Shankara himself, is this text, known as The Thousand Teachings, or Upadesasahasri in Sanskrit. Even this text was probably not put into its current arrangement by Shankara. It consists of a prose part, and a longer metrical section, which can be read separately. It establishes the non-dual view that our difficulties are caused by our ignorance of our own true Self, and that the means to liberation or realization, that is, to lasting happiness and true fulfilment, is knowledge of our true Self. The only effective antidote to ignorance of Self is knowledge of Self. The true nature of the Self, which is the reality in all, is revealed, according to Shankara, in the Upanishads, although the help and guidance of a qualified teacher is needed to fully understand and to attain direct realization. Shankara analyses the difference between Self and not-Self, between absolute Reality and what is not absolutely Real, in the way that has become the foundation of the non-dual teachings ever since. He teaches that there can be no change or processes of any kind within the Absolute, and that therefore actions and methods of any kind can only serve to purify and prepare the mind, but cannot be the immediate ’cause’ of true knowledge. He draws out the implications of this understanding in detail, leading the mind through its own efforts to the point where reliance on any limited form or process must cease. It is helpful on the path to grasp the essential difference between Self and not-self, between Absolute reality and what is not absolutely real, in the way established by Shankara, which is rationally flawless and which if followed carefully prevents us from getting lost in distractions. The value of all non-dual teachings can be judged by how completely they remain consistent with Shankara on the essential points. This book will be of interest to academic students of non-dual philosophy. For some sincere enquirers who are practicing meditation and the related disciplines, it may be a helpful book to study carefully to gain a deeper understanding of the non-dual philosophy.